Sign up for a Summer Reading Program at the local library (MWR Libraries urge families to bring their appetites because this summer, "Reading is so Delicious!" I'm not done ... but this is what we have so far. When I hear an 'I'm Bored' this summer I can say, "Let's Look at our Bucket List" and see if there is something there we can do. They won't all get done. But it will fun to think about them all. 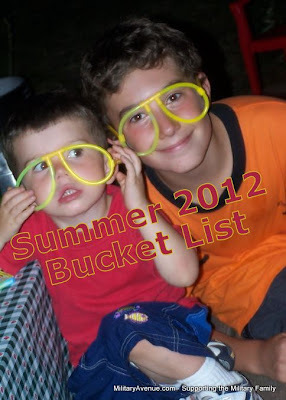 What is on your bucket list this summer? How do you keep the kids happy, busy and 'unscheduled' all at the same time? Summer Vacation, my favorite future thought! With a little planning, a lot of flexibility and smiles galaore it is going to be a great one! Have fun and cheers all along..